Does any of this sound familiar? Presbyterians discuss marriage at General Assembly; discern teachings of Scripture in light of new social relations. And no, this isn't from 2014, or 2006, or 1991, or 1980. Presbyterians have been talking about marriage and divorce since 1647. The humble advice of the Assembly of Divines, in Chapter XXIV, in addition to proscribing marriage of believers to papists, idolaters, and heretics, permitted only two grounds for divorce: adultery and willful desertion. The innocent party could remarry "as if the offending party were dead." Fast-forward to 1858. Maria C. and William A. Cowles were married in January 1839 in Massachusetts. Cowles was a drunk, "ill-natured and abusive," and Maria fled his household for Iowa after eleven years of marriage. In 1853, the Wayne County court granted Maria's appeal for divorce, and she promptly married the Presbyterian minister James H. Shields. Learning of their marriage, the New School Presbytery of Des Moines charged Shields with adultery, convicted him, removed him from the ministry, and excommunicated him. The Synod of Iowa reversed Presbytery; Presbytery appealed to the General Assembly. Since Maria proved neither that William had committed adultery, nor that he had deserted her, the Assembly upheld Presbytery, voting 106 to 52 to excommunicate Shields. "Lying, as the institution of marriage does, at the foundation of order, purity, and prosperity in the State and the Church, the Assembly cannot view without abhorrence any attempt to diminish its sanctity or to extend beyond the warrant of the Holy Scriptures the grounds of divorce." Adherence to the Westminster standards trumped compassion for abused women, in a decision the New York Times called "unwarrantably severe." But in the tumult of America's nineteenth century, faced with an increasingly mobile and rootless population, Presbyterians worked to modify the Confession of Faith to remove even willful desertion as grounds for divorce. If the Shields decision was the necessary outcome of a brand of Presbyterian originalism, the late nineteenth century saw an outpouring of hyperorthodox activism. The 1869 United Presbyterian Church of North America General Assembly appointed a task force to study the legitimacy of marriage after divorce by willful desertion. Its majority report refused to admit desertion as grounds for divorce, identifying, contra the Assembly of Divines, only adultery as the "one justifiable cause of divorce." The Assembly tabled the report, but in 1888 the issue resurfaced, with the Presbytery of Westmoreland asking the Assembly to remove the willful desertion clause from the Confession of Faith. In 1883 the Presbyterian Church in the U.S.A. Presbytery of Cleveland offered a resolution decrying the newly-prevalent practice of divorce, writing that the bonds of marriage were commonly "sundered for insufficient and trifling reasons." Following overtures in 1902 from the Presbyteries of Baltimore and Washington to strike willful desertion from the Confession, the PCUSA General Assembly passed the question to its Committee on Marriage and Divorce. The Committee continued work through the 1905 Assembly, ultimately adding a one-year waiting period on remarriage for innocent parties, a restriction nowhere found in the Westminster standards. 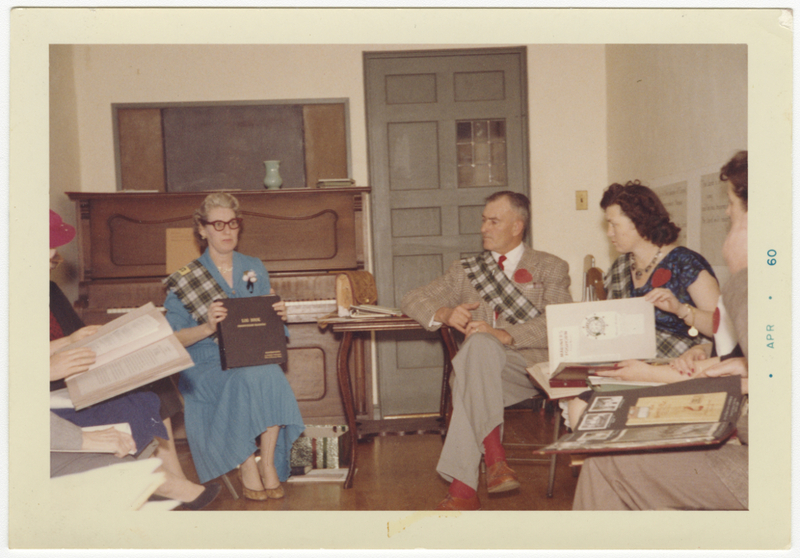 The PCUSA continued work on the issue through its Special Committee on Marriage and Divorce, which operated from 1927 to 1931 and was reorganized in 1947. In 1952 the PCUSA General Assembly moved to amend sections of the Westminster Confession, eliminating "innocent parties" language, broadening the grounds for divorce. The Confession of 1967 framed marriage in terms of compassion rather than discipline, saying, "[...]the church comes under the judgment of God and invites rejection by society when it fails to lead men and women into the full meaning of life together, or withholds the compassion of Christ from those caught in the moral confusion of our time." Searching for new means of strengthening marriages and supporting families in the early twentieth century, a number of Southern California congregations organized Schooner Clubs, first among them one at Calvary Presbyterian Church (Wilmington, Calif.). In pastor Louis Evans' words, the clubs would support couples in "the Good Ship Matrimony on the Sea of Life." With the Church their Anchor and Christ their Pilot, other nautical-themed couples' clubs sprouted in the next few years. On June 22, 1936, the Schooner and Clipper clubs of Southern California gathered at Evans' next church, First Presbyterian Church (Pomona, Calif.) for dinner and fellowship as Presbyterian Mariners, with one enthusiastic member carrying a banner which read "FIRST ANNUAL CONVENTION." Though suspended during the Second World War, the annual gathering served as the high point of Mariners' life: they met in 1940 at Big Bear Lake, at Lake Tahoe in 1946, and at Red Rocks, Colorado in 1949, where the convention was officially named the Annual Cruise. Presbyterian Mariners bonded through their accoutrements: promotional material for the Eighteenth Annual Cruise in Monmouth, Illinois asked families to bring their "club gear" and "family flags." Mariners sponsored week-long family vacations at Presbyterian camps and conference centers, the first Family Camp being held in 1955. 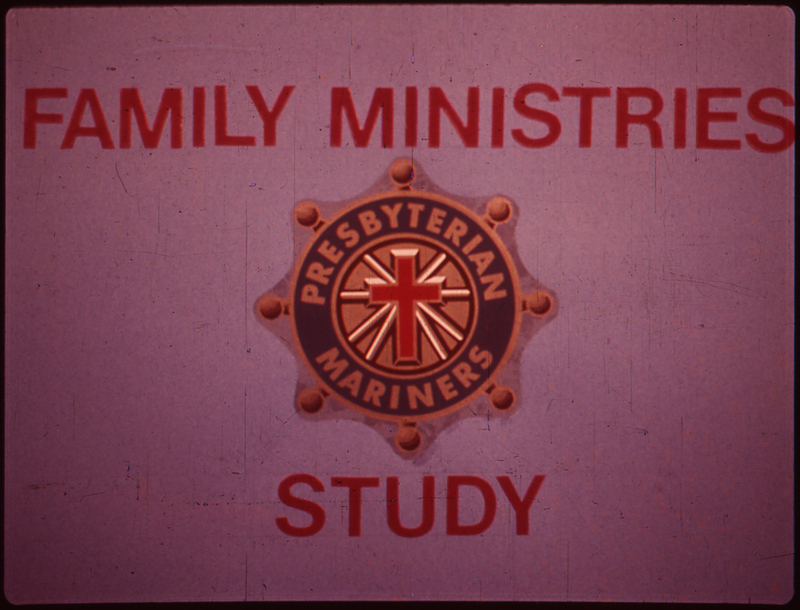 With a newfound political awareness, Mariners revised its program in 1968, calling fleets not merely to care for the Christian life of families, but to work actively for social justice. As part of this work, Mariners published guides for families, such as the filmstrip Pigeonholes are for pigeons: freeing men and women from restrictive roles (1972). Presbyterians have responded to changes in the makeup of the American family, and to the transformation of the rights and responsibilities of women and men within the family, with anxious discipline and mutual aid, seeking wisdom and ultimately acting with simple compassion.